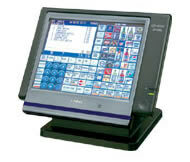 Casio's QT-6000, the flair of a PC based system with stability and reliabilty of a cash register. Experience the sensational clarity of the 12.1 flat panel, TFT, color operator LCD touch display. Through the QT-6000’s software, operator’s can easily identify items with the ability to assign graphical icons to keys. Experience the QT-6000’s sound capability used to instruct and identify operators. The Ethernet 10/100 Base TX network provides a fast, reliable and easy to setup communication network eliminating the hassles an operating system presents in networking. In addition to the Ethernet, the QT-6000 has the ability to implement wireless communications (802.11g) for those places difficult to run physical wire or environments where mobility of a terminal is essential. All of this and more without a Windows operating system, hard drive or the need to add additional RAM for performance purposes. The QT-6000’s ability to link server’s to a “ROOM SCREEN” which provides server’s a quick selection screen of tables in an assigned area of the restaurant. Color coding of tables allows servers to easily identify the status of a table whether it is open, in use, been presented, occupied or has been split. In addition to the color status the table buttons can display the server’s name, check balance, time check was opened or the last time the check was accessed. A graphical separate check screen simplifies the splitting of checks, cutting down on confusion, time and errors. The floating of checks/tables between terminals allows servers to access customer orders from any terminal in the system. Graphical icons assigned to keys assist operators in identifying items easily and speed up transaction time that is essential in this environment. A drive thru screen provides an overview of orders/cars in the queue and the time they were opened to assist the drive thru operation run more efficiently during high volume periods. The QT-6000’s large electronic journal provides store management a detailed audit trail of operation activity over an extended period of time. The Mix & Match/Intelligent Coupon discounting offered in the QT-6000 will control proper pricing and discounting when combination items are ordered separately thereby increasing customer satisfaction. Extensive Time & Attendance provides the store management the tool to control labor costs with ability to monitor employees clocking in/out, the amount of break time employee’s use, the amount of pay being dispersed per hour and a pay to sales ratio report. In addition to controlling employee labor an open interface to video surveillance is available for those store owner’s wanting to keep a watchful eye on their operation when they can not be present at the location. * Floating customer charge file with discount levels and credit limits for retail operations wanting to control their accounts receivable. * Scanning bar codes to identify an item (UPC/EAN), to recall a customer guest check and to re-print a transaction, all designed to eliminate input errors and decrease transaction time. * An optional magnetic stripe reader (QT-6046MCR) can be used for the purpose of credit/debit operations, assigning a name to a table/check, server sign-on and customer charge identification. * Stock control on PLU’s and departments eliminates the need of a PC and back office software. This page is part of GeneralManual.Com Network Casio QT-6000 Point of Sale Cash Register User Manual.